This was originally brought up at en.WP VP proposals#Darker section titles in page history. A subsequent commenter noted that the text was not even AA compliant against the background (except with 18pt font). We think we've found an acceptable AAA-compliant color with #585858. My recommendation would be the lightest-gray that achieves AAA compliance, and #585858 just happens to be the color on which we settled. Change .autocomment to use font-weight: lighter (seem to work against desire to increase contrast). There may be other styles to explore in that regard. Izno raised the priority of this task from to Needs Triage. Izno added projects: Accessibility, MediaWiki-Watchlist, MediaWiki-Recent-changes. Izno added a subscriber: Izno. Izno set Security to None. Izno added a project: MediaWiki-History-and-Diffs. Izno added a project: good first bug. Volker_E added a subscriber: Volker_E. @Izno In our work on finding design answers to users' needs, we sometimes find ourselves with different, in parts diametrically opposing solutions. While it's completely agreeable that we want to provide users with visual impairments a sufficient interface, we also have to make sure, that majority of users looking at this specific view (Revision history) are able to easy scan this by having priority in information visually set apart. Our color palette for interface elements was updated a short time ago to ensure the UI elements are aligned to at least WCAG 2.0 level AA compliance. With compliance to level AAA, it's a different story that is not solved easily without lowering differentiation between more and less important information. Therefore I'd suggest to go for #72777d from the palette as AA compliant color for the .autocomment parts. This would improve the current status quo and still fulfill the need of visual hierarchy. Related is another task, where we are discussing about further features and special needs for smaller groups of users as part of accessibility settings. 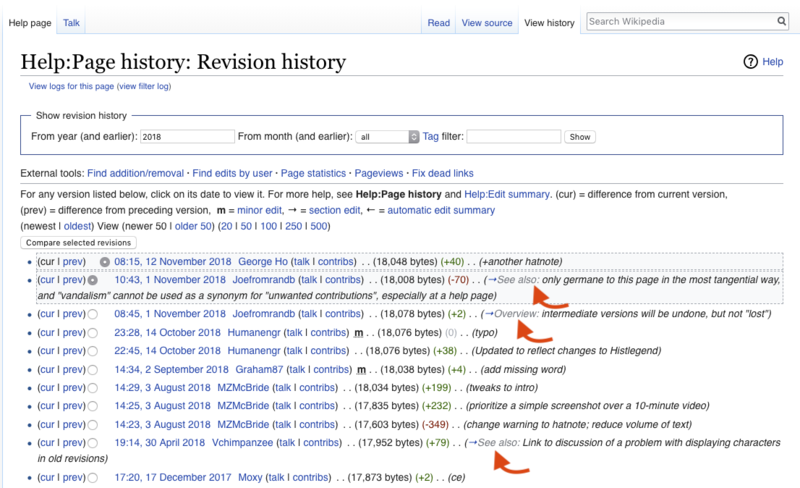 majority of users looking at this specific view (Revision history) are able to easy scan this by having priority in information visually set apart. I made this comment in the VPT discussion, in fact. ensure the UI elements are aligned to at least WCAG 2.0 level AA compliance. This is true, if all that's being considered is color. 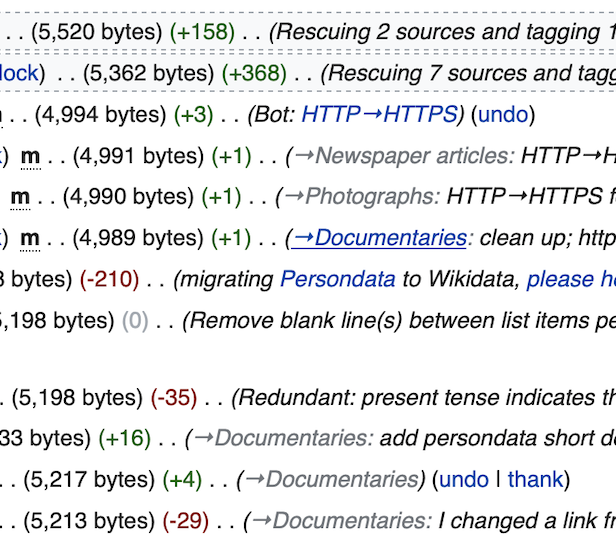 As noted above, we explored some other ways to differentiate the less-important (which is the .autocomment text) from the more-important (which is the edit summary text). Have you reviewed those options, or explored any of the options (including your suggested value) with users? I agree, color shouldn't be the only indicator (at best). But another one isn't easy to find. Italics for example doesn't work to users' satisfaction for languages like Chinese, Japanese or Korean as it's not part of the typographic tradition. For future solutions, the browser support of properties like text-emphasis is luckily inclining. And I see the suggested gray is listed there. That is good to know. I'm not sure how this is relevant to those specific proposed solutions for this specific task. Presently on en.WP and ja.WP, the line of interest (both autocomment and summary) is already italicized (I didn't check the others, but I expect the same elsewhere). If those shouldn't be italicized on ja.WP, or there shouldn't be italics at all on the line, that's a separate task. The relevance to add this design problem, is that italics is part of one of the proposed solutions. It's clear to me as well, that the current implementation might be flawed. When we're considering solutions, we should aim for most inclusive improvement possible. Volker_E moved this task from mediawiki.ui to Color consistency on the UI-Standardization board. I think we should go #54595d. The contrast is 6.72, enough for AA in small text. @Ladsgroup The task is describing further problems besides the text color, why would you go for #54595d over the proposed #72777d, which also fulfills level AA on white background? We have to consider different needs, not only color contrast and increasing contrast might go hand-in-hand with lowering differentiation between higher and lower priority information. Therefore I would be cautious about using #54595d. Since the other task is making everything the same gray again, reopen this one. ...The section title autocomment is less important than the actual comment and should be deemphasized, while making it link-blue adds emphasis to the detriment of the actual comment. @Ciencia_Al_Poder Two issue with such treatement, first in the proposed image it would run into color contrast accessibility issue again. Second, it would over-emphasize a less prioritized link again. Visual treatment should guide the eye for the most important information and de-emphasize the less important. Therefore the grey color was chosen beforehand. The problem with #54595d and #585858 to me is that they are too similar to the black in a summary text. The link is then even more hidden. A gray colour right in between white and black it should be. Is it such an important part of the line we need to achieve AAA compliance? The original colour seems ok to me, since it passes at least AA for both black and white, maybe just a slightly darker, like #71767C (right between black and white on WCAG scale) or #70757B (still AA compliant for both black and white). We could’ve just made a link discoverable by people with original colouring on any active states like was proposed by me originally. Although a selector for this would be pretty bad to implement with something like .autocomment a:not(:hover):not(:focus):not(:active):not(:visited) (maybe someone can propose something shorter). Agree with @Volker_E about other solution being proposed here. Updated the screenshot in the task. @stjn I just tested .autocomment, .autocomment a:not(:hover):not(:focus):not(:active) and I kind of like that.. Here i am hovering the Documentaries section link. Just to make sure it wasn't missed, in the other ticket @Jdforrester-WMF raised a concern with using :hover being problematic for people on touch devices in T165189#4790357 but I believe @stjn addressed his concern T165189#4790562 by noting that it's not just hover, it's any active states including :focus and :active. I played with it a bit and like it as well. I can't speak for whether it meets our accessibility needs/standards though. What about additionally wrapping the arrow or everything else into an extra element, to make the arrow always blue (and thus easily discoverable as link), like before? That way users without ability to hover over the link will still be able to recognize it as link, and combined with the "turn blue on interacting" above will quickly learn that the whole section name is the link. I just noticed there is a bit of precedent for this styling in the StructuredDiscussions UI, in their history, reply and thank links. Yes, anything that relies on interaction before revealing itself to be a link is not discoverable for people on touch devices (except for a rare few odd devices which we can disregard). That means that any system that only shows the link via some form of interactive element – be that :hover, :focus, or :active – is insufficient. Yes, anything that relies on interaction before revealing itself to be a link is not discoverable for people on touch devices [...] That means that any system that only shows the link via some form of interactive element – be that :hover, :focus, or :active – is insufficient. On the other hand, that depends on the extent to which immediate discoverability is necessary. While clicking the link to get to the section is a nice shortcut, it may be that everyone discovering it isn't so needed that it outweighs the concerns over emphasis. As @TheDJ noted, there's precedent for that in Flow's interface. On the other hand, that depends on the extent to which immediate discoverability is necessary. Given that the near-universal consensus to the change was "wow, that's clickable?! ", clearly the answer is "quite". We can’t say for sure whether it was because the arrow was so small or because users generally don’t know where to click. Implementing affordance for actions should be theoretically enough to make it discoverable for now, and then it could be revisited. Absolutely. The two standard design affordances on the Web for "this a thing you can click and it will change the page somehow" are blue coloured text with a hover underline effect, and a graphical representation (to some level of abstraction) of a button. This discussion is proposing doing neither of those things. Hardly. I did see a number of people with that reaction, but on the other hand I saw a similar number (if not more) criticizing the resulting sea of blue. Some people even did both. Really, the real near-universal reaction seems to have been to not say anything about it either way. We only see the people who felt strongly enough to comment, whether because they didn't know the arrow was a link before (despite it having been blue!) or because they didn't like the new swaths of blue.